During the Quantum Rise expansion, we introduced a certificate system to help players deal with the recommended use of skills and ships available in our game. With a new age upon us of redefined ship roles and extensive rebalancing, it became readily apparent that its use as an effective guiding tool needed to be revisited. 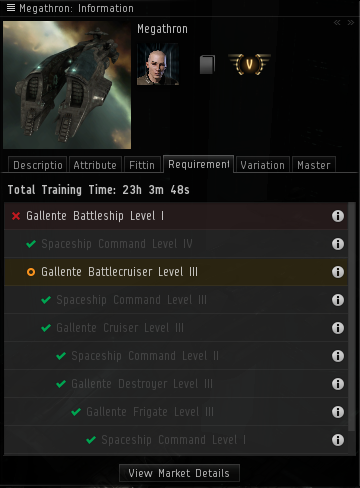 That is why we are introducing a new certificate system, along with mastery levels for ships in the Winter expansion of EVE Online. Certificates help players understand what to train next, and as each ship gets a set of certificates associated with it, players will also be able to see how well they can fly and fit them. We will also change the skill requirements for operating turrets, to match our role-based overhaul of ships that has been going on for a while. Read below for all the details about the changes, and how this new information will be displayed in-game. The first issue with our current certificate system lies in its over-complicated use. Each certificate lists a certain number of required skills, which in itself is a fine idea. However, the problem lies in having other certificates mentioned as prerequisite, creating a list of complex dependencies that are difficult to follow through. On top of that, each certificate has to be manually claimed and managed from not one, but two separate windows in the Character Sheet: the Certificate Tab itself and the Certificate Planner. This conflicts with the goal of the whole system, which is to provide a simple recommended guideline for players to follow through. As such, we are revamping how they work – instead of having a certificate for each progression level (Basic, Standard, Improved, Elite), a single certificate will now be the collection of all those levels, condensed in a single package. 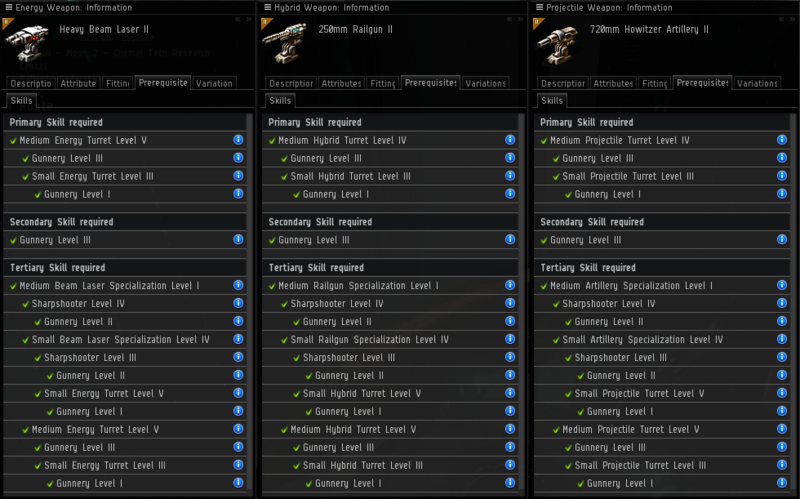 Example, on Tranquility, under the “Navigation” category, we have 4 different “High-Velocity Helmsman” certificates. After the overhaul, we will only have one single “Navigation” certificate, containing all levels within for increased visibility. This change reduces the number of certificates to claim by at least four. As shown in the instance above, we also are removing nested certificates as requirements for other certificates, which will significantly clear the progression up. From now on, each certificate will only have skills listed, always showing players the next step(s) they have to complete. This further clears up the progression and prevents the player from getting confused from over-nested requirements, from the very new-player friendly level 1 certificate to the uber-elite "I have maxed all skills in that field" level 5 certificate. Certificates themselves are being overhauled to better reflect the current state of the game today. That means redundant ones, like the Starter Profession Certificates, will be removed as they serve no practical purpose. We are also going to tweak the certificate API to match the changes, which means some external party applications will need to be modified after the Winter release. Certificates will now be automatically claimed, no need for manual fetching anymore. The “Certificate” tab will be merged within the “Skill” category in the Character Sheet and both will be sorted by the same groups, since they are related to each other. Certificate tooltips have been updated to display accurate description on what they are actually doing. The Certificate Planner is no longer needed and is being removed. With all the changes above, number of Certificates is approximately reduced sixfold, from around 360 to 60, while losing no progression value whatsoever. As we went through the Certificate overhaul, we realized some of the item skill requirements don’t make that much sense right now. 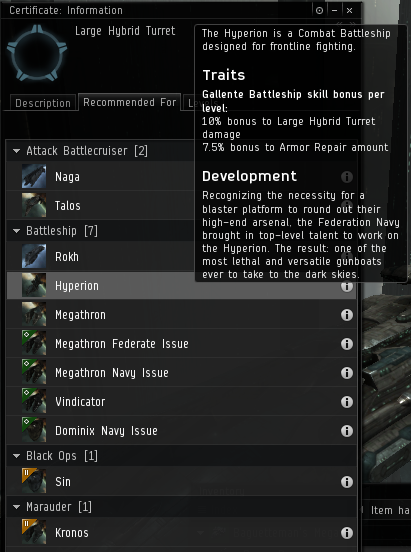 In particular, skill requirements for Tech 2 turrets is a relic from an age where the artificial progression system made sense and doesn’t necessarily apply today: as noticed with the ship balancing project (nicknamed "Tiericide" by our playerbase), we are focusing on promoting role over tier, and this should also be true with turrets. Training Large Tech 2 turrets should not require proficiency in smaller ones if one wishes to focus in this specific gameplay. As such, after internal and CSM approval, we are changing training requirements for turrets to follow a pattern more consistent with missile launcher requirements. That technically means Tech 2 medium and large turrets will no longer require smaller gun specialization skills at 4 to be trained. The Sharpshooter and Motion Prediction skills will still be required though. Exact changes are listed below. There is much more to flying a ship than just training the required Spaceship Command skills - while certificates make sense to represent the general evolution of your character, we wanted to introduce a metric to clearly make this point. The “Shield Reinforcement” certificate, which contains skills that increase your shield buffer (hitpoints and regeneration rate), are needed to completely maximize the hull, but not critical at lower levels, which is why it is not appearing there. It also is important to note that more than one ship may share the same certificates. As such, unlocking a mastery on a specific hull may automatically grant it on others, allowing you to quickly see which ships share the same role, combat philosophy or weapon system, for instance. As a further example, the Hyperion, Dominix Navy Issue, Megathron Navy Issue, Megathron Federate Issue and Vindicator all have the exact same Certificate requirements together. Thus, training up for one of those will automatically grant Masteries for the others as well. 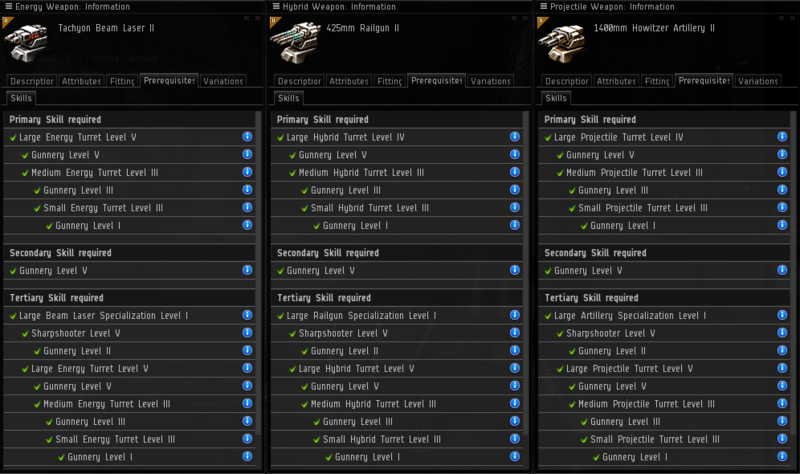 Skill requirements, based on Spaceship Command skills, granting the capsuleer ship bonuses. 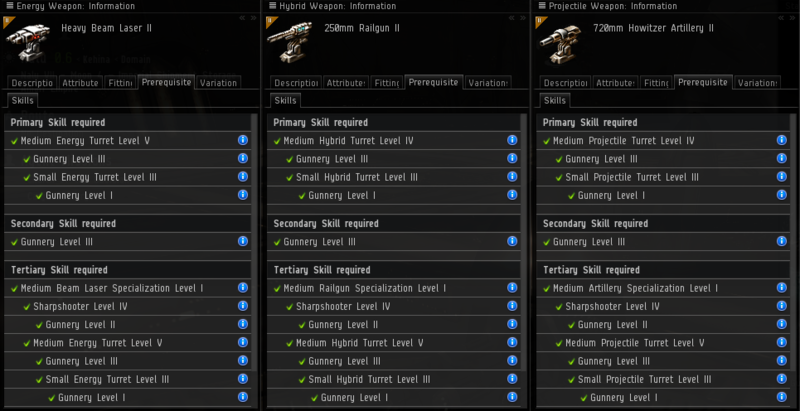 Example: Amarr Cruiser skill on the Arbitrator. Ship masteries, a collection of certificates, giving the pilot a general idea of which skills to train to fly and fit the ship properly. However, remember that certificates and masteries in general are not meant to be specifically tailored for the individual needs of advanced pilots or even professional corporations (that’s where corporation created certificates might come in handy) – they are meant to be a general and basic guideline for all players to look at when progressing throughout ship classes. 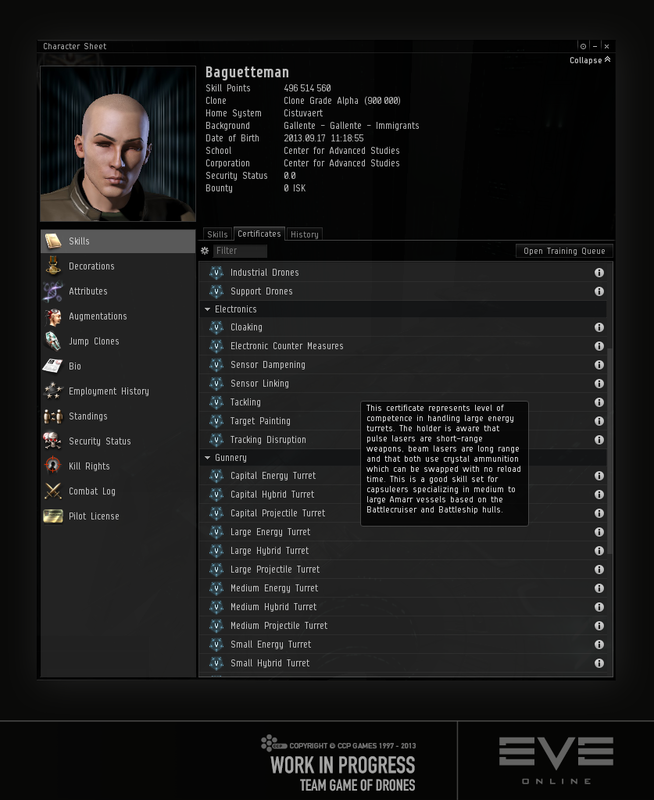 While we were looking at the Ship Show Info we realized the “Prerequisites” tab could use some polishing as well. As such, we are removing the various groups inside the tab named “primary / secondary / tertiary skill required” as they are quite confusing: secondary skills are mandatory in all cases, not optional as the name would suggest. We also are changing the tab name to "Requirements" to further express the idea those are needed to fly the hull itself, in contrast with masteries, which are recommended skills. We are then significantly increasing the readability as a whole – as well as improving the “total training time left” countdown logic: the timer will now skip lost sub-requirements as long as you can still fly the ship with the main skill. 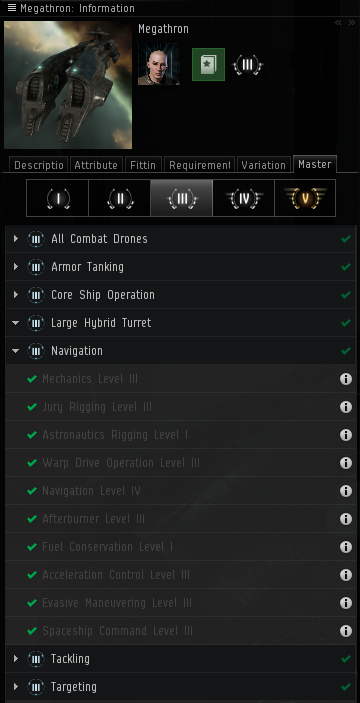 For instance, if you have Amarr Cruisers at level 1 but lose Amarr Destroyers 3 for some unlikely reason, it will keep showing 0 days since you can still fly the Arbitrator. That is one problem we encountered during the skill reimbursement last Spring that we wanted to fix. The Capsuleer cannot fly the ship for not having the various Spaceship Command related skills trained at all. The Capsuleer owns the needed skills but doesn’t have the required level(s). The Capsuleer can command the ship and has the required skill level(s). The Capsuleer can command the ship and has the maximum skill level(s). 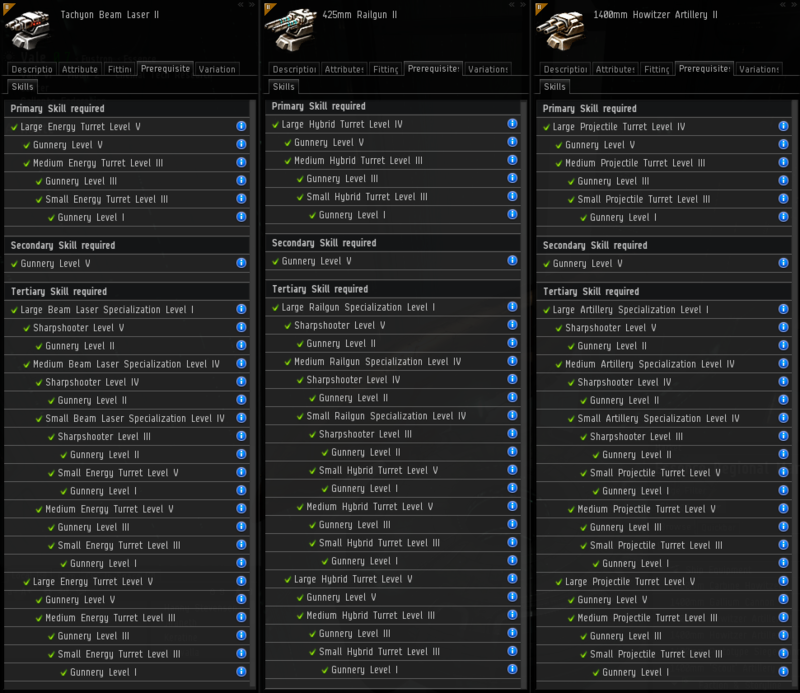 We are also adding the two main progression metrics to the header of the ship show info window – skill requirements and the mastery, so each Capsuleer can quickly see either of them on any ship show info without having to navigate to individual tabs. 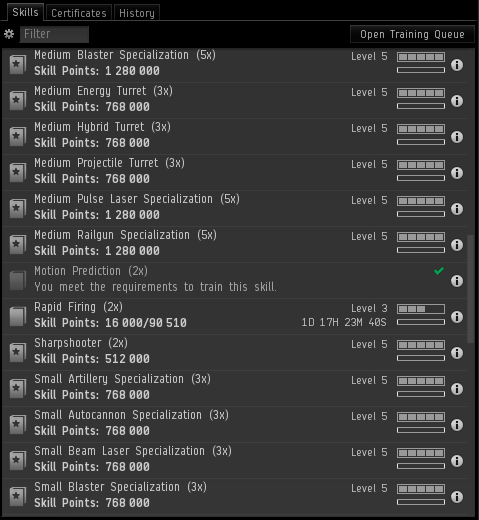 If the user wants to know more, clicking the Skill Requirement or Mastery icons themselves will open the respective tabs, at the proper levels. And that’s it for now ladies and gentlemen, hope you like it so far – we have more changes tied with certificates cooking in the oven right now, so stay tuned for more details on that matter when they become available.